Submitted: 18 November 2005 Operator: BIFFA Waste Services Ltd Location: Wanlip, Leicestershire. The project was designed as an alternative to sending organic municipal wastes to landfill. It is contracted to help meet the city’s target of 60% waste recycling and recovery by 2006. It is funded by Leicester City Council at a cost of £80 per household per year. It processes the biological fraction of Municipal Solid Waste from the Leicester area, after ball mill processing at Bursom Recycling Centre. Source separated kitchen and garden waste is also accepted. 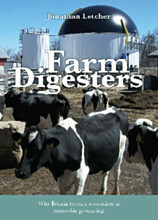 The digester can process up to 50,000 tonnes/year. The facility includes 5 digester tanks, with a total capacity at any one time of 8000 tonnes. Electricity: 1434 kW (ROC Accredited) Digestate: There is a potential for this to be marketed for agricultural use.